Tuesday October 9th 1900 I helped with the work a great part of the forenoon Mr Henly was here for dinner helping Leonard cut corn Will went to the Lafevre sale. I went to town in the afternoon and took Mother over town, was late getting home. 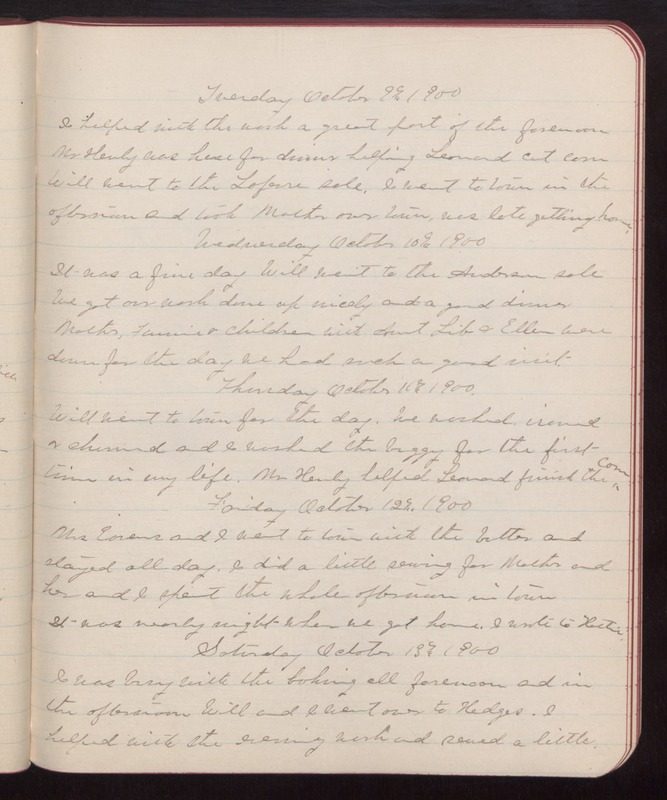 Wednesday October 10th 1900 It was a fine day Will went to the Anderson sale We got our work done up nicely and a good dinner Mother, Fannie & children with Aunt Lib & Ellen were down for the day We had such a good visit. Thursday October 11th 1900. Will went to town for the day. We washed, ironed & churned and I worked the buggy for the first time in my life. Mr Henly helped Leonard finish the corn. Friday October 12th 1900 Mrs Earens and I went to town with the butter and stayed all day. I did a little sewing for Mother and her and I spent the whole afternoon in town It was nearly night when we got home. I wrote to Hattie. Saturday October 13th 1900 I was busy with the baking all forenoon and in the afternoon Will and I went over to Hodges. I helped with the evening work and sewed a little.